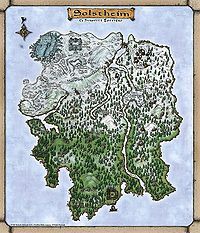 The Hirstaang Forest covered most of the southern half of Solstheim, south of the Isinfier Plains. Bloodskal Barrow and Brodir Grove formed the northern border. The west, south and eastern borders ended at the northern waters of the Inner Sea. The forest was destroyed following the eruption of Red Mountain in the Red Year of 4E 5, leaving only ash wastes in the southern half of Solstheim. The Hirstaang Forest was home to numerous barrows and ice caves. There were only two Imperial settlements on the island, both located within the forest: Fort Frostmoth and the mining town of Raven Rock. Barrows like Bloodskal Barrow, Himmelhost Barrow, Frosselmane Barrow, Kolbjorn Barrow, Skogsdrake Barrow and Valbrandr Barrow made the Hirstaang Forest home to the largest concentration of barrows anywhere on Solstheim. The few ice caves in the region, like the Halls of Penumbra, Ulfgar the Unending's Dwelling and Kolfinna's Dwelling, made the Hirstaang Forest as extensive underground as it was above ground. Due to the slightly warmer climate of southern Solstheim, the Hirstaang forest, like the Isinfier Plains to the north, boasted a large array of flora and fauna. Various shrubs, holly, belladonna and the Solstheim pine tree provided building materials, firewood, shelter and food. Animals were both unique and amazing but could be quite dangerous, especially in packs. Such animals like tusked bristlebacks, common wolves, grizzly bears, snow bears, horkers, spriggans and rieklings made the Hirstaang Forest an excellent hunting ground for hungry reavers, berserkers, fryse hags, the Skaal, residents of Thirsk and Imperial hunting parties. The forest was also full of easily recognizable landmarks which helped the lost traveler navigate. To the southwest was the bay of Raven Rock, and the Earth Stone lay to the west, close to Bloodskal Barrow. Brodir Grove lay to the north, just west of the Iggnir River. Travel in and around the forest was limited mainly to Divine Intervention spells and by boat. Boats docked at Fort Frostmoth and Raven Rock. At Fort Frostmoth, boats traveled to Raven Rock as well as Khuul. Most of the travel on land was restricted to walking or levitating. The Hirstaang Forest did not endure blizzards, so travel was relatively easy regardless of the weather. The Red Year saw the devastation of the forest, as the blast wave from the Red Mountain eruption obliterated much of the southern half of the island. Fort Frostmoth was completely destroyed, and Raven Rock was heavily damaged. By 4E 201, the forest had yet to recover fully, as constant ash fall from the Red Mountain continually covered it. Some smaller, hardier plants such as ash creep clusters had begun to grow, and some invasive species from Morrowind such as netches took up residence as well. Ash fall resulted in the formation of Heartstone deposits, and through unknown, likely magical means, ash spawn roamed the desolate remnant of the forest. Additionally, the Telvanni settlement Tel Mithryn was established on its southeast shore in the aftermath of the Red Year. For more information, see the Bloodmoon article. ^ Official map of Solstheim from Bloodmoon. This page was last modified on 5 March 2019, at 10:38.